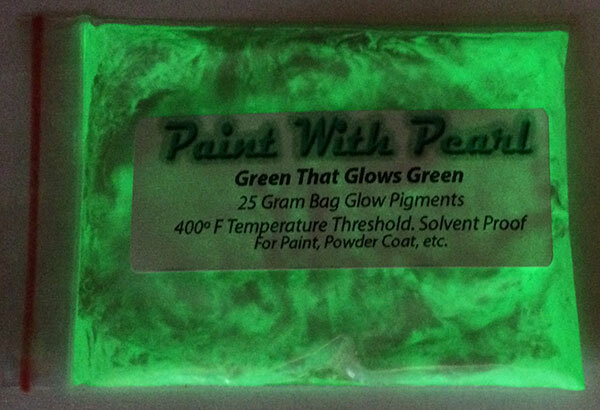 We have may glow in the dark pigments. The most expensive by far, is the white to white glow. This one glows white for hours and is the perfect custom paint job for a white vehicle, or white graphics. It tends to glow for several hours. Our other pigment which is more expensive is a white pigment that glows red. Imagine having a white car that glows red all night! That is the stuff! But we also offer a wide variety of of other glows. Remember that Glows have a color all on their own. We sell some glow in the dark pigments that have a color to them, but don’t plan on being able to spray over some other color and not get it washed out or milky. Glow in the dark pigments are not transparent, and they will cover up your base color. It is really up to the user what they do with it, but we recommend having the glow on the top coat. Some people talk about covering it up with Illusion Pearls or white chameleons, but we have yet to see that. If it does get a glow underneath ghost pigments, then we can’t wait to see it. Try some glow in the dark, and see what you think of it. Each 25 gram bag is a heavy pigment, so it needs to be agitated inside the hopper/gun, and should be sprayed out of a gun with a siphon feed hopper, and not a gravity feed hopper. In a gravity feed hopper or paint gun, the pigment will sink fairly quickly, and may clog up the gun. Some custom painters will actually put marbles into their paint guns to keep things agitated while they spray the heavier pigments in their custom paint jobs. The end results have been amazing, and it is always good to see that.